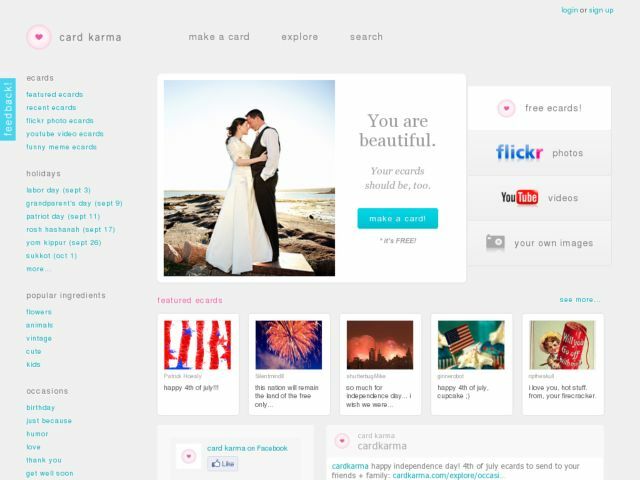 with card karma, you can make super cool ecards using millions of images from flickr and videos from youtube as well as your own facebook photos. you can share cards with a short url on twitter, post it to a facebook wall, or just paste it in a good ol[HTML_REMOVED] email. join the community, and you can also like things, get a profile to show off your creations, edit your cards, and all kinds of good stuff. it[HTML_REMOVED]s all FREE! you don[HTML_REMOVED]t need an occasion to make someone feel happy, so make a card and share it today!